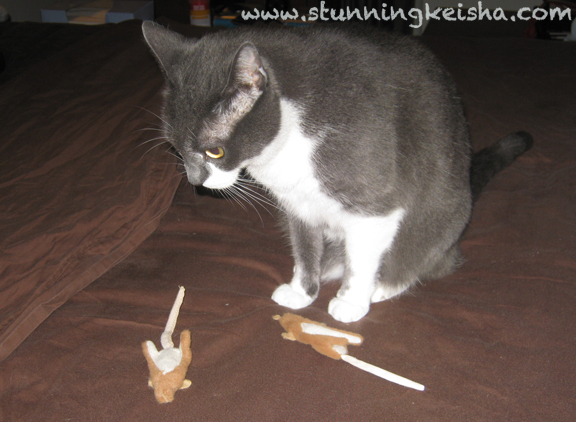 One of the only smousy toys I actually play with is my Skinneeez smousy that I ordered from Nip And Bones. When I'm in the mood—and I think that no one's around to see me—I fling it up in the air and toss it around. I play like a cat and, believe me, I played with Skinneeez late last night and again this morning. Look! I deded both of them! The one closest to my heart is the original. Many months ago, I had lost my Skinneeez so TW bought a replacement until they got off their lazy butts and found the original. I never played with the replacement like I did the original. Yes, Woman, I can tell the difference! Find the real Skinneeez. Show TW you're smarter than her. She must think I'm really stupid cos she bought a cheap knockoff in Walgreens the other day. C'mon, Woman, the real deal is only $4. Any cat with half a brain can see the difference. She might as well have gotten the grey one. That's how obvious it is. TW made the photo as crappy as she could so you couldn't see the difference. She thinks they're identical enough that I wouldn't notice. HAH! The Walgreen's smousy is fuzzier, lighter in color and the tail is fatter. TW thinks I can't tell the players without a scorecard. Guess again, TW. Oh dear. Maybe they are just different species. That's it! Those look pretty cool...like if I got one wet and dropped it on the Woman's face while she was sleeping, she would totally think it was real. NOW i kinda want one! Just because humans are stupid, they don't have to assume we kitties are. Sheesh! We can't believe TW tried to put that one over on you! Nope, you can't fool a kitty, they know their toys! Cheap knock offs? That is the kind of dumb trick my peeps would try. We say Epic Fail too. Have a fabulous Friday. Does she KNOW who you ARE? *shocked face* Humans... they got NO respect. Unbelievable CK...How dares she try to fool you? Maybe it's her being a sickie lately that's warped her brainz? Momz and I both send healing thought to TW so she gets better soon and orders you "the real thing"
Mum gets me cheap toys from the 99 shop sometimes. I don't care really because I prefer playing with bits of string or cardboard boxes. Younwould think the humans would know this by noe CK! Skinneeez looks very fun to play with! As IF! Like you wouldn't know the difference, CK! We wanted to thank you and TW for your kind and thoughtful comments when Sammy had to leave for the Bridge. We are really lucky to have such wonderful and compassionate friends. Humans think us cats aren't very smart. Well, we're so glad you showed TW she was wrong about that! The woman here still hasn't replaced our ripped narna! TW won't make that mistake again!! Mario here on M's account - Of course you can tell the difference. Any cat with half a brain could. Humans think we're so dumb when we really out smart them by far. M wishes I'd play with my toys like you do, I expect the humans to toss them around, and if I feel like chasing them, I do. If not - I don't! I guess she's prolly been spending a lot of time in Walgreen's lately, eh? The Human bought, like, 67 kinds of medicine when she was sick. She didn't bring me ANYTHING, not even a knock-off smousy, so count your blessings. Brian sent us over and hope you are feeling better. Stop by our party for some wild fun! OMC! Why in the world would TW think you wouldn't notice? I mean come on, us kitties are smarter than our peeps realize for sure! They are so different! Better steals TW's card when she not looking and comes on over to the shop, MOL. Okay okay okay--I'll try h=not to be such a wuss. I do like my fev-vers--I was just off of wand toys for a bit after that one tried to KILL ME and all! Maybe you should come over and help me to not be such a coward, eh? The pillow is free tonight. Peoples! Now me wonders if theys can tell the real deal from a knock off!! And they thinks wes can't? Humans are really stoopid !